For many years now people suffering from asthma and other breathing problems have been measuring their peak flow rate with the help of peak flow meters tin order to analyze how good or bad their condition is. The recordings of these rates over a period of time help doctors study and diagnose their condition. 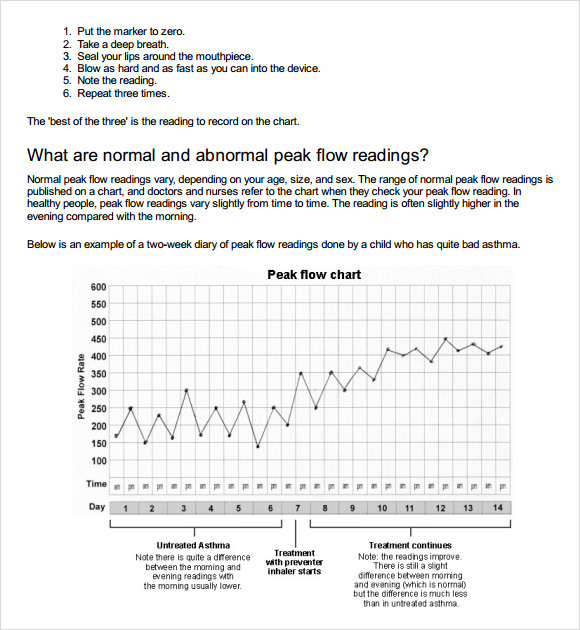 Use these peak flow charts to keep a detailed record of your lung’s capacity while using the neat layout and statistics placement to make ensure maximum clarity. You can customize the colors and Sample Chart Templates styles as per your convenience. Check the samples out here and download here for free. This blank peak flow chart printable, as the name suggests, is a blank template for flowcharts, showing the peak hours of the day. 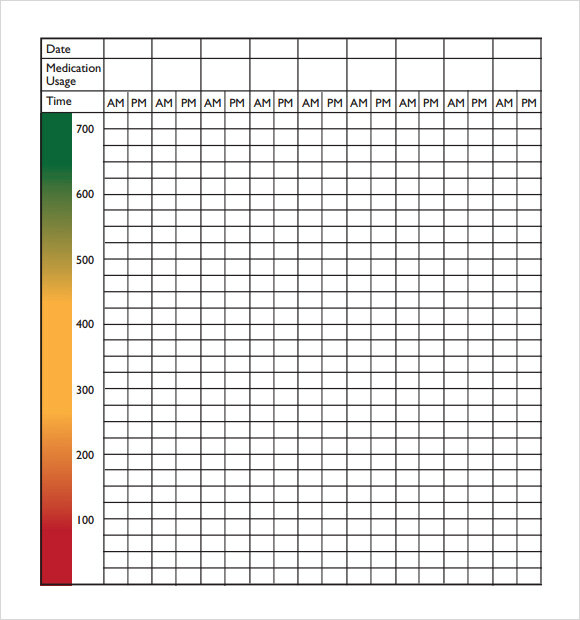 It contains slots for the dates, medication usage, timings- am and pm, and also has a color bar alongside wherein the tint turns from red to green, from 100 to 700, showing the peak in activity levels. 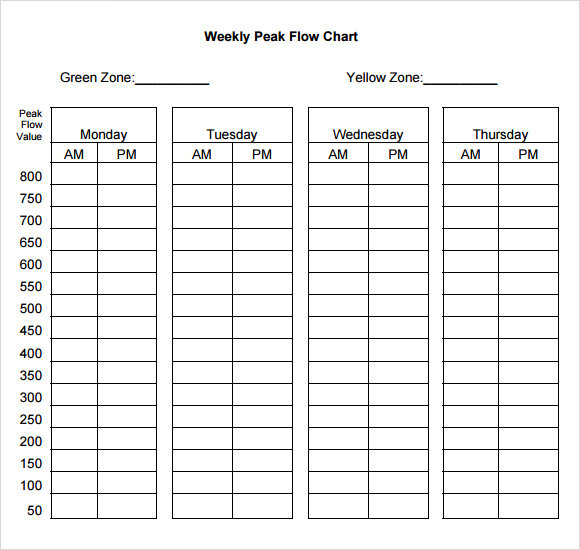 This peak flow chart to print, as the name suggests, is a peak flow chart template that is ready to be printed. It includes patient’s age, height, predicted normal PEFR, before and after, date and time slots for monitoring frequency, and a table for measuring the peak expiratory flow rate in liters per minute which ranges from 100 to 650. 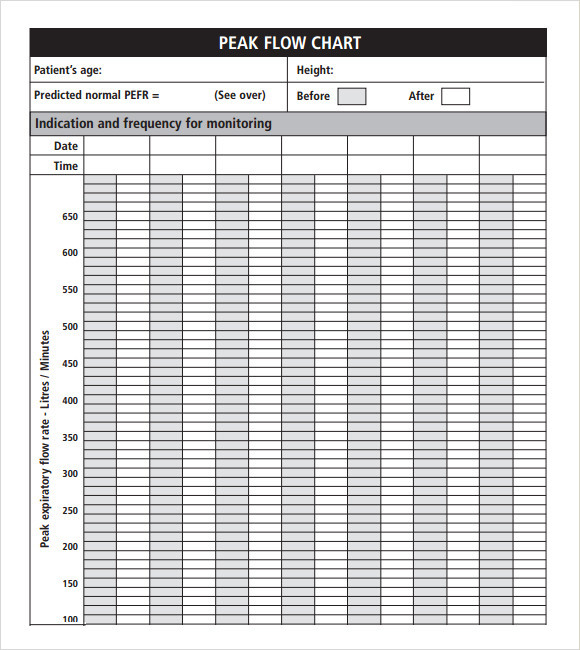 This sample peak flow chart template, as the name suggests, is a flow chart template showing the peak activity levels of a patient. 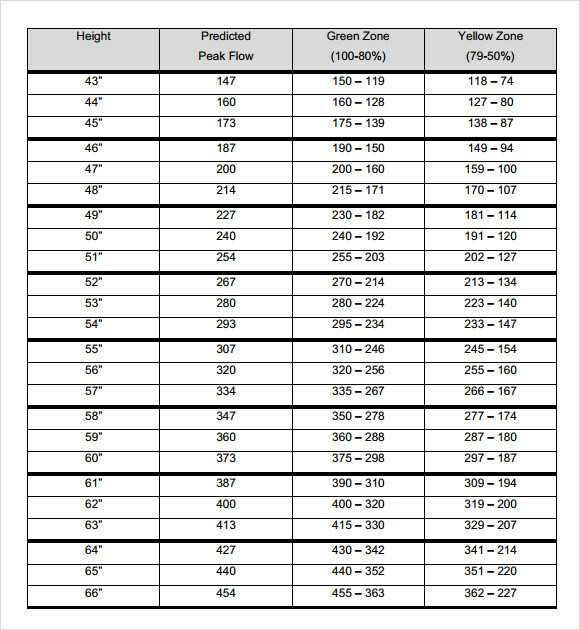 The template includes a number of slots, which are, name, best peak flow number, green zone, yellow zone, red zone, controller medicine, dose, fast acting medicine, dose, peak flow measurements over a 10 days period, ranging from 50 to 700. Apart from these, it also includes, peak flow number, asthma symptoms, trigger, fast acting medicine used. 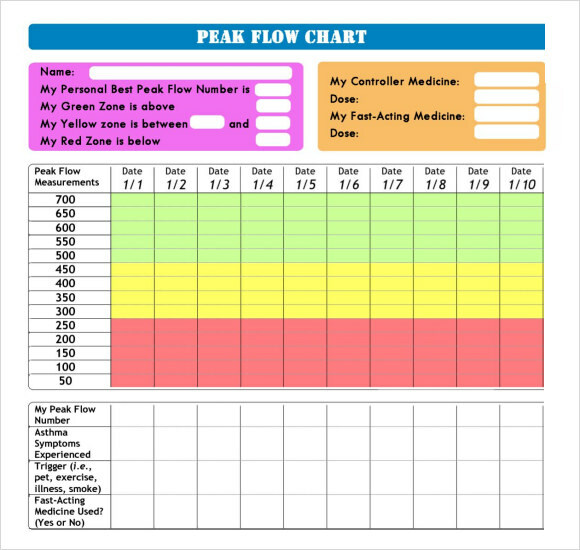 This free peak flow chart printable, as the name suggests, is a printable peak flow chart that is available for free. It has a start date, a date of exposure and a finishing date. It covers the peak levels of activity over 4 days divided into 4 different time periods which are 8:00, 12:00, 18:00 and 22:00. It measures the level of activity, ranging from 140 to 600. What Are Peak Flow Chart Templates? A flowchart can be defined as a type of a diagram that represents a process, workflow or algorithm which shows the steps in box shaped structures of various kinds which are connected by arrows. It is a diagrammatic representation which illustrates solution models for specific problems. 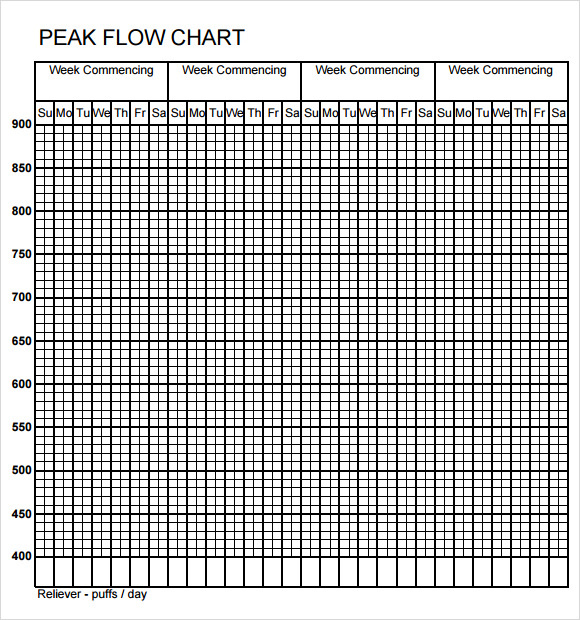 A peak flowchart template is a flowchart template that shows the peak activity levels over a specified period. What Are The Different Types Of Peak Flow Chart Templates? Data peak flowchart. System peak flowcharts. It is to be noted all of these templates focuses on control and not the flow itself. Although preparing peak flowchart templates is very easy to do, but some might find it very daunting, so we have brought for them especially a set of peak flowchart templates. All you have to do is download any of these, and you’ll be all set to go.